I smell the bacon cookin’ and even hear it sizzlin’ before I even open my eyes. And the coffee aroma is actually going to get me out of my cozy goose down sleeping bag. I must be dreaming… I know we don’t do real camp fires here, don’t even bother to set them up when it’s this dry in So Cal. So I’m thinking maybe my husband is a genius. He must be using those Kelly Kettle accessories he brought along – making that little piece of camping gear the perfect outdoor cooking stove! 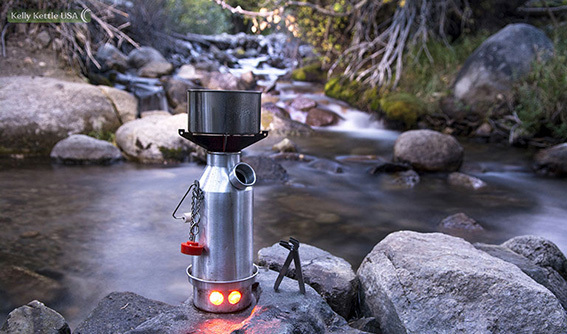 Yum, eggs, bacon and coffee from just one little camp stove. We didn’t even have to buy or pack fuel. It uses all natural fuel like twigs, brush, and pine cones. No wonder he brought those steaks, baked beans, hot dogs, and burgers. I bet we even do smores! You name it. Our Kelly Kettle has the capability to do all of our campfire favorites. Kelly Kettle used to be just an easy way to boil water quickly, do coffee, hot chocolate, noodles, and oatmeal in a snap. Now with the addition of the new Hobo Stove and cook top accessories, the Kelly Kettle is one serious piece of “must have” camping gear. A real game changer! Now you will eat like a camp chef with this one little camping stove. And all the cooking accessories fit into the Kelly Kettle itself. 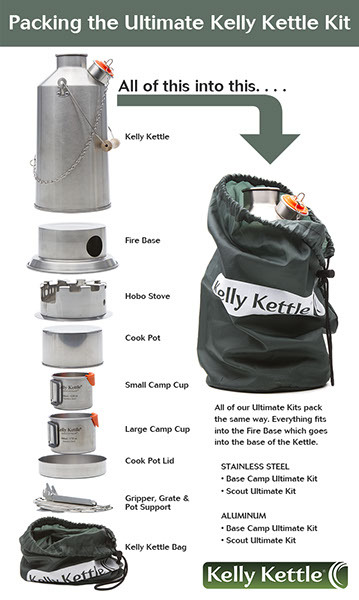 Use the Kelly Kettle as a portable cooker using the Cook Set accessory to cook beans, make chili or stew and then get out your Hobo Stove to do some serious fryin’or grillin’. No more messing with building a big campfire just to cook dinner. (Still recommended for the ambiance if you’re in an area where they aren’t a fire hazard) You seriously never have to carry fuel. Save money, carbon friendly and totally environmentally safe cooking! The whole set fits inside the base of Kettle for ease of transport! The camping and backpacking community are pretty stoked about the Hobo Stove and Kelly Kettle cook sets. If you have any doubt about the purchasing a one of the best camping stoves ever, check Kelly Kettle reviews. All good!